This thought-provoking collection explores the variety of ways that we seek personal and spiritual connections–and the ways that we can poison ourselves and others in our quests. Elizabeth Kadetsky is a writer of keen insight and graceful prose. In The Poison that Purifies You, Elizabeth Kadetsky deftly constructs fully realized places—some foreign, some familiar—and fully realized characters—some of them more like us than we’d like to admit. She tugs gently on these places and people until she finds their loose strings, and begins spooling out quiet strands of damage or dread. Before you know it, the dread is your own. These stories sneak up on you, hijack you, and before you know it, it’s too late. A stunning first collection. 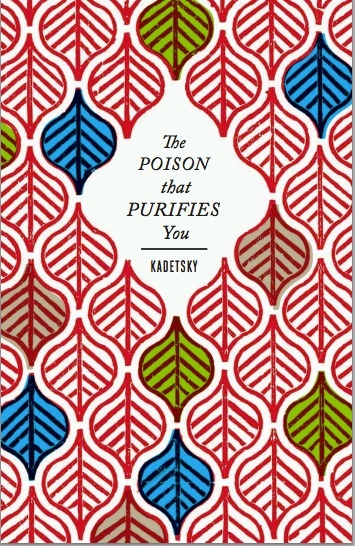 Funny and smart, with a mouthful of zingers aimed at both your heart and mind, Elizabeth Kadetsky’s The Poison That Purifies You is a seamless orb of stories about race, travel, purity, anguish, disappointment, and above all, yearning. With a cast that includes taunting babies, Muslim kidnappers, and New York bicycle messengers, Kadetsky’s stories surprise and enthrall the reader, unfolding to reveal a world touched with mystical elegance. Unexpected as the work of Paul Bowles, unflinching as Flannery O’Connor’s, these stories are journeys not just into far flung places but into the most mysterious parts of our psyches. And, like the best adventures, they will open your eyes and change your heart and leave you breathing hard. Elizabeth Kadetsky is a brave writer and a masterful guide; she approaches fiction with a searching and strength that makes me want to follow her anywhere. I was transfixed by The Poison that Purifies. Transfixed, awed, shocked, and transported, story after story. Kadetsky’s fiction is so brave and complex and beautifully written; it pushes the boundaries of comfort and makes your heart pound. Earthquakes, kidnappings, marauding monkeys; men who thieve and menace and hurt; acts of love and God and shame—it’s all there, in Kadetsky’s bright and mesmerizing world. An Italian soul-seeker in India encounters an antique racist toy-bank from 19th-Century America and believes it to be an incarnation of Krishna. A fertility-seeking single woman in New York’s Chinatown becomes fixated on a Chinese boy and plotsa kidnap. An American archaeologist suffers from under-medicated bipolar disease after the 1976 earthquake in Guatemala. A New Yorker interprets the small earthquake of 2011 as a sign of conspiracy, and her obsession masks feelings of grief surrounding the disappearance of her self-destructive twin sister. Following the existential mystery of Paul Auster, Paul Bowles’ critique of the tourist, and Flannery O’Connor’s redemptive grotesques, Kadetsky adds a sharp and nuanced voice to the short story, calling upon her extensive travels abroad and study of languages for a portrayal of innocents often caught in the tangles of global alliance and discord. Winner of the Paul Bowles Award from C&R Press, recent and forthcoming publications from the collection appear in Antioch Review, Glimmer Train, Storyville, and The Weekly Rumpus, while the Pushcart Prizes and Best New American Voices anthologies, Michigan Quarterly Review, Gettysburg Review, and other venues have featured the works. See Kadetsky’s post on David Gutowski’s LargeHeartedBoy’s Book Notes blog, in which Patti Smith, PJ Harvey, Tom Waits, and Tomaso Albinoni intermingle. Stream the playlist here. The Poison that Purifies You was named a best under the radar read for fall alongsidesuch authors JM Tyree, Darcey Steinke, and others. “The Art of Distraction,” in the October Glimmer Train bulletin.